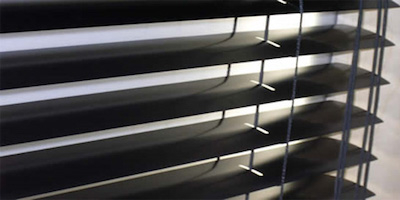 Venetian Blinds come in three categories: Plaswood, Wood, and Aluminium. They allow light to be directed to different positions. Wood Venetian Blinds are ideal for windows that don’t get too much afternoon sunlight (as the harsh sun will fade and splinter the blinds after time). A classic blind, Wooden Venetians are made of the highest quality Basswood. We stock a huge selection of color options from wood stained, coated, and modern colors. 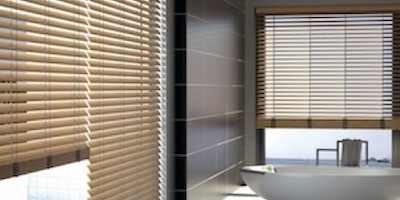 Plaswood Venetian Blinds are ideal for bathrooms where they won’t be affected by steam. 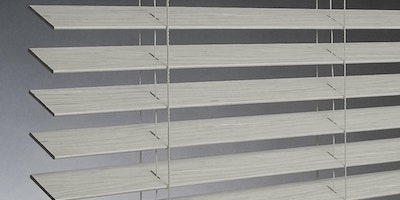 Some Plaswood Venetian Blinds do not do well with lots of sunlight, so care needs to be used when selecting which Plaswood/Fauxwood to choose. These blinds are heavier than wood and don’t have the same Wood-Grain texture. However, they are made in many different colors with or without grain embossing for a more natural look. They can be wiped down with a damp cloth which makes them easy to clean and maintain. Aluminium Venetian Blinds are idea for any window of your home. Because they come in 25mm., 35mm., and 50mm. Slats, they’re versatile and practical. They also are available in “wood look” options which come with solid Wooden Valances, Wood toggles and a Wood bottom bar. These finishes make the Alu-Wood range especially attractive. Aluminium Venetian Blinds are a simple, easy solution to any window. Renters love these blinds as they aren’t a huge investment and make a classic statement to any room of your home.